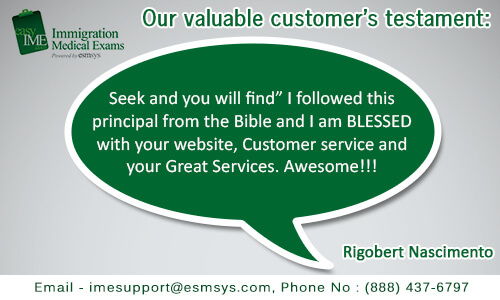 One of our valuable client’s feedback for easyIME. This entry was posted on October 18, 2014 . An amazing experience – A valuable client speaks! This entry was posted on September 20, 2014 . This entry was posted on September 13, 2014 . Understanding the importance of Immigration Medical Exam, easyIME in order to make it simpler and easier has helped number of immigrants community by providing free information on I-693 form, provided free listing of Civil Surgeons and Lawyer in the web portal easyIME.com, we are happy to receive great testimonial from our trustworthy applicant. This entry was posted on September 6, 2014 . 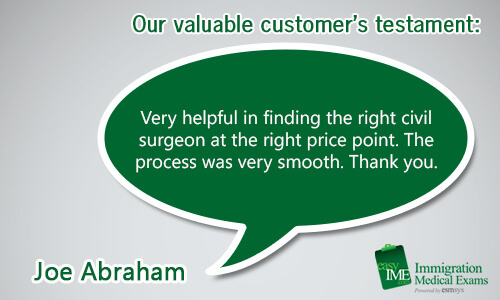 “Joe Abraham” – Very helpful in finding right civil surgeon at the right price point. The process was very smooth. – thank you. easyIME likes to share information of US immigration, USCIS and Immigration News and it is first of its kind to cater for Immigration community to US. easyIME has stretched its hands in field Immigration Medical Exam by making easy for the Immigrant. This entry was posted on August 23, 2014 .